Virtual Life VS Real Life – Are You Worried? And the question is obvious, because no one wants to find themselves stuck in something unproductive, when they could be doing something better with the time they’ve got. But also the online tools have become much a need, than just the sources of entertainment and knowledge. Name it! Whether it be Facebook, twitter, newsletters in your mail inbox, the RSS feeds, LinkedIn, video games or anything to which you can relate yourself. Perhaps this stuff has its own role in keeping you updated, providing information, or socializing. Where it remains a personal choice to select your own platform, based on your needs of marketing, advertising, sharing, etc. Yet it is clear that, these are the needs which hadn’t existed in past, but are created today. And in such situation, it is not easy to not feel trapped and make a fool of oneself. Eg: Social media to promote something < internet for social media < A device <….and so on! • Less physical activity – People who stay online and spend hours in front of their laptop screens, lack necessary physical exercise. They are generally advised to engage themselves in some real games, take a walk or workout. • Less socializing – Its natural that, when you’ll spend more time in virtual world then you’ll spend less time in the real world. But, talking to the neighbor to the next door online has become a too common habit. Whereas instant messaging apps are used to do the same thing. People who stay online for long hours are sometimes misinterpreted as the ‘Anti-socials’, who rip their heads in the screens of their cellphones and PC’s. Yet the virtual world is capable of connecting us with people across the globe, and opening new doors for interacting with people. • Effects on health – Staring constantly at the screen makes eyes tired, sitting on the same place for hours without moving causes back-pain, and all such things. But similar things happen in real world too, since some of the harms stay inevitable, whether the world is real or virtual. Have you thought about how was the ‘Real world’, before ‘Virtual world’ was born? – We often end up doubting ourselves, and think about how our life could be, or how it had been in the case of older generations which were untouched by the virtual world. Same! – Yes, it is the answer for which you’ve been searching for. Not wholly, but almost the same. The people in olden days too didn’t do anything much productive, and did what was right and possible under those circumstances. • They too needed entertainment – Either in the form of drama, festivals, or some tiny social gatherings, people in the past searched for new ways to entertain themselves. They read books, they read newspapers, they played board games, they played cards, and they did this because this was what was available at that time. Later on these things got replaced and televisions, tapes, and other new devices took their place, until internet was born. • Knowledge and education – It was a time when much sources weren’t available, people used only books and some other printed material to get information. They used manual dictionary, we use apps. They turned the pages of books, we search on search engines like Google. • Socializing – They had their own way of socializing, pure and perfect. People in olden days met each other on a regular basis, merrily arranged social gatherings and connected in the real world. But, the world and people have changed a lot. No more exist the same people or the same time. That doesn’t mean that people don’t connect in the real world. We have just reduced our circle of contacts for the sake of privacy and security, in which we too have people who we trust and believe in. Yet there is an additional virtual community, which we’re a part of. Real world – It is the world in which we exist and live. Everything happens here itself. Where we don’t act like like robots, cherish the joys of senses, create the art, feel our emotions and stay humans. It is the place where we stay like any other human being with our real identity preserved. Virtual world – It is a kind of another world within this real world, in which we can live many other lives. Here we can interact, share, gain knowledge, create, play and do anything possible in the real world. Using it is okay, but just starting to live in it is not. It is clear that we humans find a way towards better alternatives. You could’ve been gossiping on the streets instead of using IM’s or you could’ve been playing chess with someone else, instead of online multiplayer games. Also, you would’ve been going through books to find out the information you need instead of searching it online. It is quite clear that then and now, everything remains the same, except the fact that technology is progressing too much and spreading in the nerves of society. It is true that “those were the good old days” when many other things happened. However, we’ll have to accept the never ending progress of technology. And it can be done only by becoming a part of it. And if you are against the virtual life ,or think that it is useless and shouldn’t exceed at a greater pace then, Sorry! Because progress is the nature of technology. It will keep growing, invent new gadgets and change our lives extremely by making things easier (even if its good or not). So the best way to cope up with this change is to be a part of it, instead of resisting it. Because it won’t stop over anyone’s opinion and increase rapidly. • You can die a hundred times in games, and connect with the people all over the globe. That doesn’t mean at all that I’m asking you to ‘Exist like a machine.’ You’ve got many other things to do. And most of the real things happen in the real world only. You are free to exist virtually if you’ve got a purpose, but bound to have some limits for yourself. 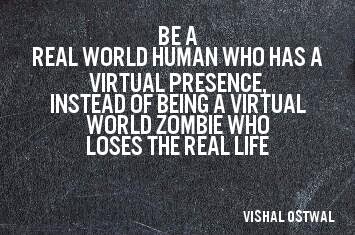 Be a real world human who has a virtual presence, instead of being a virtual world zombie who loses the real life. Its all up to you that, how you create peace between your real life and virtual life. If you do it for a purpose, work, etc. Its fine! Technology is created for our ease. But don’t let it take a grip over your real life. What are your views about real life vs virtual life? Feel free to share them in comments.